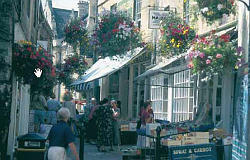 In and around the unspoilt market town of Bradford on Avon which is one of the last outpost of the Cotswolds in the western corner of Wiltshire close to the borders of Somerset and only 8 miles from Bath. 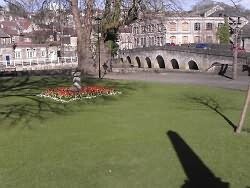 The magical appeal of the town's position on the banks of the River Avon gives visitors a wonderful setting for leisure, cultural and tourist activities. 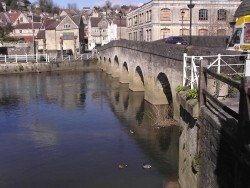 The Town Bridge (shown in the image above) crosses the 'broad ford' on the Avon which is the origin of the name Bradford on Avon. There may have been a wooden or tree bridge over the ford in Saxon times but the Normans built the first stone bridge. It was narrow and dangerous and built without parapets so that people kept falling into the river. The width of the bridge was doubled by the construction of another alongside it. Two ribbed and pointed arches of the original Norman construction can still be seen on the eastern side and if you look under the bridge you can clearly see the join! On the bridge is a small building which was originally a chapel, the fish on the weather vane is a Gudgeon, an early Christian symbol. However, the chapel was later used as a small prison or "Blind House" where local Bradford-on-Avon drunks and troublemakers were left overnight to cool off ! 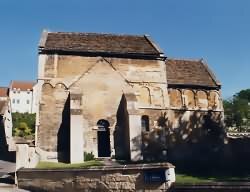 This charming church, in the centre of Bradford on Avon, dates from approximately AD700. After many different uses and some alteration, it was rediscovered in 1856. The church was purchased from private owners in 1871 and its renovations corrected. It differs from the other Saxon churches in the UK in that the whole building appears to have been erected at one time, with no additions later. The town's position position on the River Avon gives it a magical appeal. Bradford-on Avon developed as a centre for textiles, mostly wool, and the Bradford-on-Avon you see today was shaped in these times. Many of the large mill buildings along the river are former woollen mills, and most of the houses up on the hill (Tory, Middle Rank) are former spinners and weavers cottages. The wool trade died away in the area, moving North to large industrial centres Like Bradford Yorkshire which some say was named after Bradford-on-Avon ! The large mills were taken over by the new and burgeoning rubber industry, and the rubber plant was the main employer in the town for decades, manufacturing tyres and wiper blades. Sadly that industry has moved on too, and many of the mills are being converted to residences. Shoddy was a Yorkshire term for cloth made of woollen yarn made from the shreds of loosely woven woollen fabrics, these were torn up and then respun into a cheaper, inferior cloth. This cloth then became affordable to the ordinary citizens and was produced in the Bradford mills up in Yorkshire. The Bradford on Avon mills however were not prepared to produce Shoddy materials and therefore their order books over a period of time soon became empty in comparison to those in Yorkshire which were prospering. Eventually the mills in Bradford on Avon started to close down and the industry went into decline. Such perhaps was the price of pride. The area around Bradford-on-Avon is riddled with mines, used for quarrying the local stone which is similar to the stone which shaped the city of Bath. In the sixties two of the mines in Bradford were taken over by a mushroom growing firm, the even and humid atmosphere of the old mines being perfect for such purposes. The mine at Westwood just outside the town was used for industry, including the Royal Enfield motorcycle plant. During the 2nd world war the mine was used to store part of the crown jewels which had been removed from London for safety! Culver Close near the centre of Bradford-on-Avon was used for breeding rabbits mainly for food, and Conigre Hill was where pigeons were bred mainly also for food. The Shambles is a crooked little lane running between Silver Street & Market Street. The name derives from the Anglo-Saxon word "scamel", meaning a bench on which goods were laid out for sale, and is still used by shops in much the same way, fresh fruit and veg are displayed each day on wooden benches. The St Thomas More Roman Catholic Church in the heart of Bradford-on-Avon was designed in 1854 by the architect Thomas Fuller, who also designed the Canadian Houses of Parliament in Ottawa. Thomas Fuller adopted an eclectic approach, and incorporated French, German and Italian Gothic elements, resulting in this splendid Bath stone building with its domestic Tudor style, Jacobean gables, massive oriel window and onion dome atop an octagonal tower. The magnificent Tithe Barn at Barton Farm was used by wealthy landowners to collect "tythes" or taxes from the people of Bradford-on-Avon. These would be paid in the form of produce and livestock. The building has been restored and has one of the largest stone roofs in Europe. Some of the scenes from the movie version of Chaucer's "Canterbury Tales" were shot here. Built in the early 14th century, produce would be brought to the barn across the 14th century packhorse bridge which was built especially for that purpose. Open all year except 25 December - 10.30am to 4.00pm Monday to Sunday. The park is a favourite spot for cycling, picnics, walks and rummaging about in the craft shops in the outbuildings next to the huge tithe barn which is still standing after 600 years. 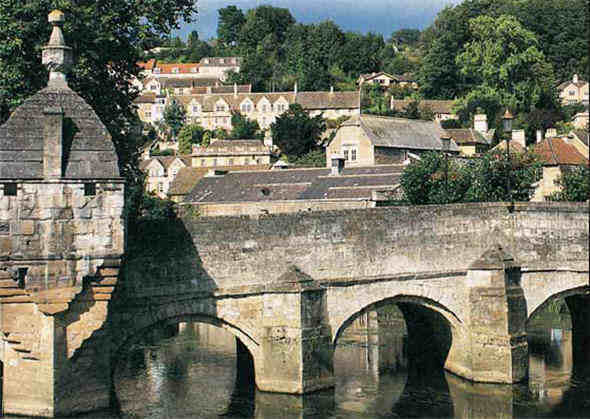 Any visitor to Bradford-on-Avon will find out that walking uphill is inevitable sooner or later! Many of the small weaver's cottages in Bradford-on-Avon are balanced on the side of a steep hill, each row visible over the rooftops of the rank in front. The climb to St. Mary's Tory is an exhausting one, through the narrow passageways between each row of houses, but it is well worth the effort. From the top of the hill the view is spectacular! The whole town is spread out before you. The outlying countryside is clearly visible including the Marlborough Downs, the Mendip Hills and Westbury White Horse. Trinity Church - In the centre of Bradford-on-Avon. The church is originally Norman and was extensively modified between 1300-1310 and 1350-1500. The Victorians also left their mark in the north aisle. Church of St Laurence - Near the Trinity Church is the famous Saxon . This 7th century building is all that remains of a monastery which once existed in the area now known as Abbey Yard. St Mary's Chapel - On the hill overlooking the town. Originally this tiny church was a medieval building where pilgrims would stop on their way to Glastonbury.